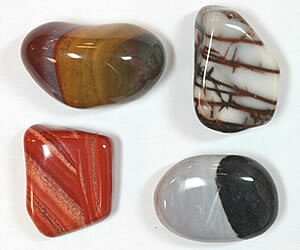 Home » Rock Tumbling Library » Are Tumbled Stones Valuable? 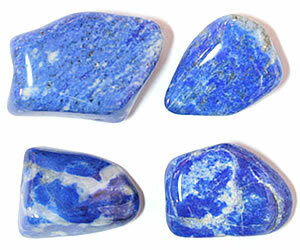 Tumbled lapis lazuli costs a bit more than most other varieties of tumbled stones because the rough has a higher price. We really like tumbled stones and we would love to tell you that they are extremely valuable but most of the time that would not be true. Most of the time, the price of tumbled stones is based more upon their "cost of production" instead of their "intrinsic value". Most commercially tumbled stones are manufactured in batches of a few thousand pounds from common materials. The "cost of production" for these stones is typically a few dollars per pound. This very low cost is possible because the manufacturer purchases the rough and abrasives by the ton and the labor required to tend the tumbler is spread over a few thousand pounds of tumbled stones. Sometimes common opal makes exceptionally nice tumbled stones. Rock straight from an opal mine is sometimes tumbled to clean it and identify pieces with potential. Machines the size of concrete mixers are used for this work. There are significant additional costs. After the stones are tumbled they must be sorted. Tumbled stones are often sorted by size, by color, by material and by quality. 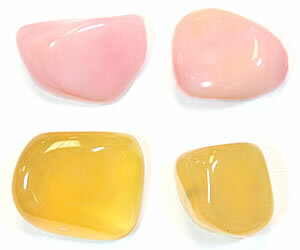 Any broken or reject stones found during the sorting process are removed. Sorting by color or material must be done by hand and is labor intensive. Sorting them by quality grade requires even more time because each stone must be individually inspected. Most of the tumbled stones sold in the United States are mined and tumbled in Asia, Africa or South America factories before they are shipped to the United States. Lots of stones are mined on one continent, shipped to another continent for tumbling and then shipped to the United States for sale. Very few companies have the equipment needed for tumbling large quantities of stones and the expertise to do a great job. Shipping rough rock across oceans to the manufacturing site is very expensive. Shipping tumbled stones across oceans to the United States is also very expensive. Once the stones arrive in the United States they must then be shipped from the port to the importer's warehouse and then shipped again to the retailer. Before they are sold at retail, tumbled stones must be packaged, labeled and placed into inventory. Each of these activities has a measurable cost. The bottom line is... Most tumbled stones sold at retail have a price that is almost totally derived from the costs of manufacturing, sorting, transportation, packaging, and retailing. 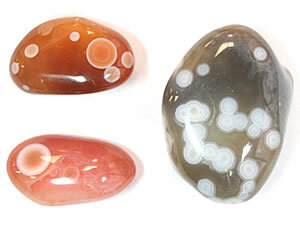 Nicely polished eye agate is considered to be a premium tumbled stone. Some tumbled stones have a value that is above the costs of manufacturing, sorting, transportation, packaging and retailing. These stones are made from a scarce raw material that has a higher market value or made from a common raw material that has exceptional beauty. Examples of tumbled stones with an elevated value based upon being made from a scarce raw material include malachite, lapis lazuli, opal, turquoise, sugilite, moonstone, and chrysoprase. Even with a scarce raw material to start, beauty, stability and other characteristics of quality must also be present for the stones to have added value. A tiny percentage of stones produced from common raw materials can have a premium value if they have spectacular colors and patterns that make them highly desirable. We have seen tumbled pieces of spectacular eye agate, labradorite, fire agate, common opal, rutilated quartz, petrified wood, fancy jasper, coral and colored obsidian being offered for sale at prices of five to fifty dollars for a one-inch to two-inch stone. These spectacular stones are usually produced "by chance" when a piece of spectacular rough occurs in normal production material. Less often they are produced when a hobbyist deliberately selects a special piece of rough and decides to tumble it instead of using it to produce a cabochon or other higher value item. Premium tumbled stones have an exceptional combination of shape, color, pattern and finish. Who Buys Premium Tumbled Stones? The market for spectacular tumbled stones is very small. They are sold as "collector's pieces" or as rough to people who will cut them into cabochons. They occasionally appear for sale on auction websites or at gem and mineral shows. That is where we would sell them if we didn't have a website with visitors who like pretty tumbled stones. We do not believe that premium tumbled stones are an investment opportunity. Their intrinsic value is very low and they are very difficult to sell at a premium price. If you took a bag of premium tumbled stones into a pawn shop they would probably say "these stones are really pretty but we don't want to buy them". Selling them online or at a mineral show will require a lot of labor, incur some costs - and you will need a lot of patience to wait for the right buyer to come along. We really like tumbled stones and own a lot of them. However, we only buy what we really like and what we will enjoy using ourselves or giving as gifts.